I came across a very surprising YouTube video which problematises some of the assumptions and theoretical notions floating around in Chinese Bronze Age studies at the moment. 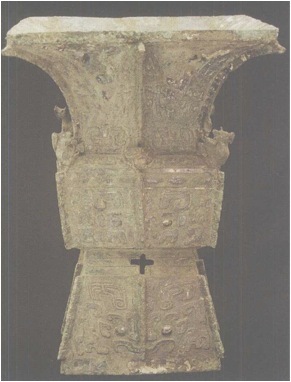 Recently, questions about the extent to which a tomb occupant’s ethnic identity might be ascertained from the archaeological record, or more specifically ascertained from burial goods, have become popular within studies of the Chinese Bronze Age. 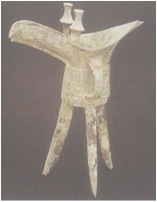 As more detailed evidence comes to light of possible interactions between the Late Shang Dynasty, who resided at Anyang (Henan Province) from roughly 1250 to 1045 BC, and the nomadic peoples to the north (occupying modern-day areas of Xinjiang, Gansu, Qinghai, Liaoning, southern Mongolia) – and the influences of these mobile peoples on the Shang and their material culture – so scholars have begun to speculate about the possible ethnic identity of individuals who were interred with objects seemingly influenced from the northern zone. The theoretical proposition is that foreign objects denoted the ethnicity of the deceased. The case of tomb M54 at Anyang provides us with a fascinating example of both the pitfalls and the potential of such studies. 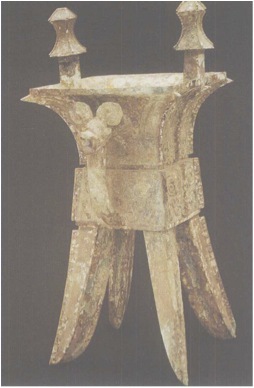 Generally, the chariot, chariot and horse riding paraphernalia, bronze knives with animal-pommels and ring-pommels, socketed weapons (as opposed to hafted weapons), jingles and rattles, bronze mirrors, and realistic animal forms, all of which appear at Anyang, are regarded as northern or foreign objects or motifs, which were appropriated and adopted by the Late Shang elites. 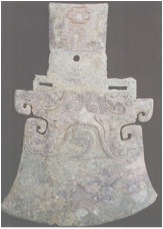 These bronze objects were sometimes deposited in rich tombs which are usually interpreted as housing members of the Shang elite. The assumption that these tomb occupants who were buried with such bronze objects might have been of northern descent is based tenuously on the direct correlation between the ethnicity of the deceased and the objects placed in his or her tomb. In short, a person buried buried with northern objects was a northerner. Tomb M54 at Anyang appears to turn these assumptions and theoretical propositions on their heads. The grave was published in 2001 and is one of the most lavish tombs to be excavated in recent years, stirring much excitement in Chinese archaeological circles. 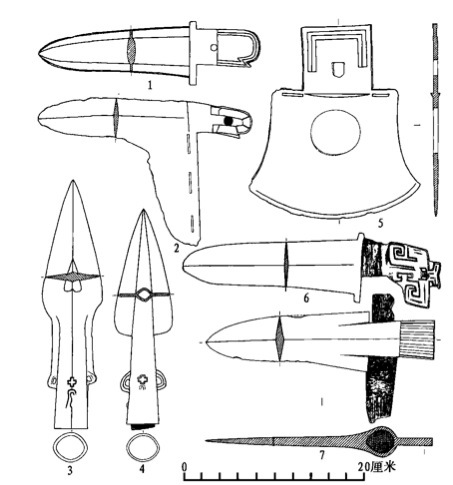 The ritual vessels and some of the weapons were inscribed with the title Ya Chang – possibly the name of the tomb occupant. 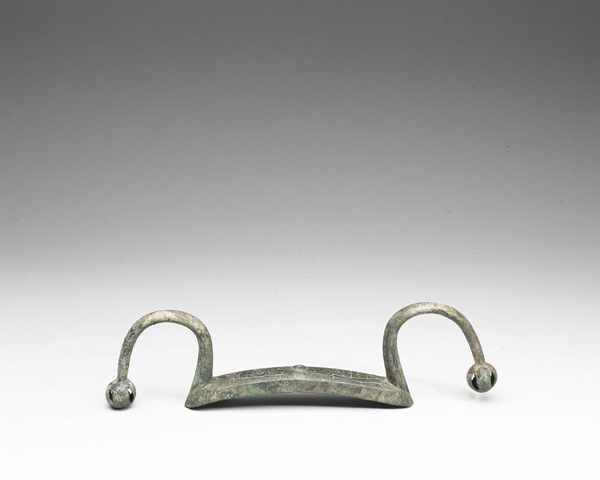 Alongside the vast quantities of bronze weaponry and other bronze objects such as bells and tools, the tomb also contained six bow-shaped objects. 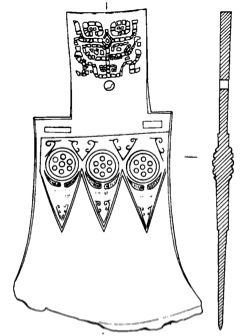 One of the bow-shaped objects (pictured above) carried terminals in the form of realistic animal heads and mosaic or inlay decoration on the main body. 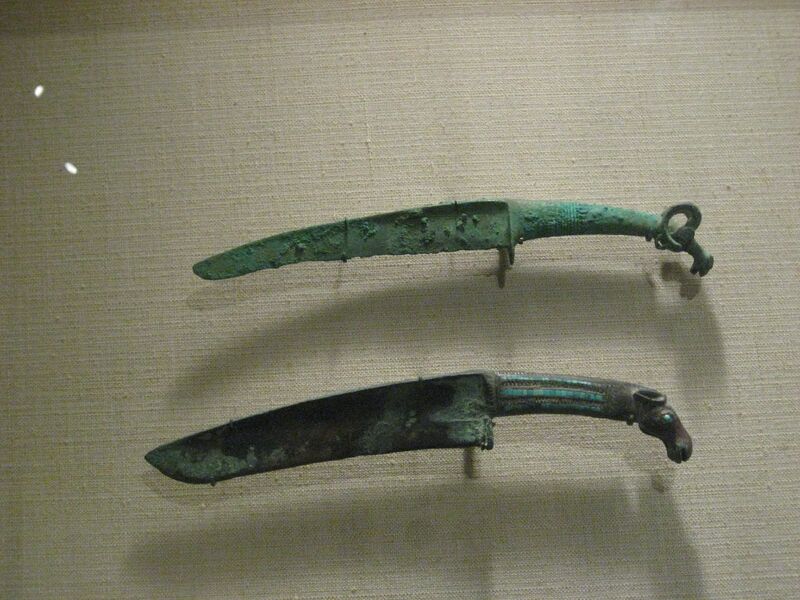 The tomb also contained animal-headed knives, similar to those pictured above. Thus, based on the presence of gold leaf decoration, six bow-shaped objects and various animal-headed knives in tomb M54, and taking the theoretical proposition that individuals buried with foreign or exotic objects might be outsiders in origin, one might reasonably conclude that the tomb occupant of M54 was a northerner. The results suggest that the tomb occupant (Ya Chang) did not come from Anyang! However, he did not come from the north either. 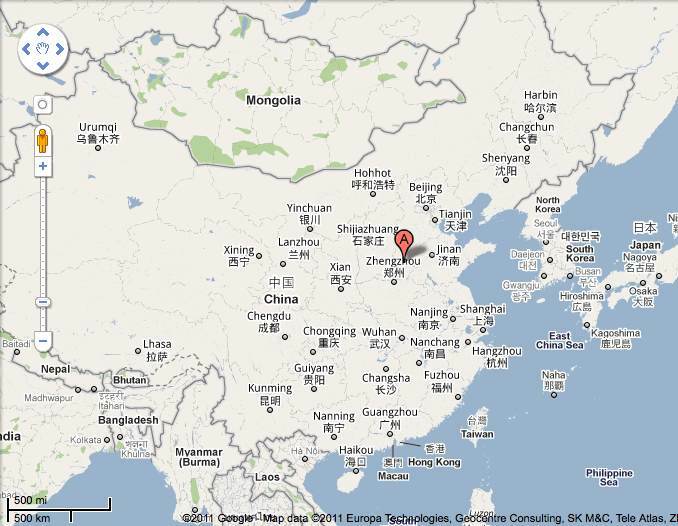 In fact, Ya Chang appears to have been a southerner – possibly from the Xinyang region – 400km south of Anyang. Therefore, while Ya Chang was an outsider, he did not originate from where the exotica might lead us to believe. In short, the tomb occupant was a southerner interred with a few northern objects. The assumed one-to-one correlation between foreign objects in a tomb and the ethnic origins of the tomb occupant is, in this case, not accurate. And, I believe that this rupture now means that we are on very shaky ground in following such a line of reasoning. 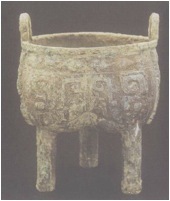 At the same time, tomb 54, the presence of Northern Zone objects at Anyang and the fact that chariots and horses would have initially required trained people such as ostlers and chariot repairmen – all of whom were possibly northerners who resided at Anyang – suggests that the Shang site was composed of peoples from across present-day China. Indeed, one would not expect Anyang to have been homogeneous in its population. However, using burial goods to determine the origins of tomb occupants is problematic as tomb M54 shows. The wider implication of this study is other graves where the tomb occupants have been interpreted as foreigners through this type of reasoning need careful reconsideration. I will discuss some of these tombs in later posts. 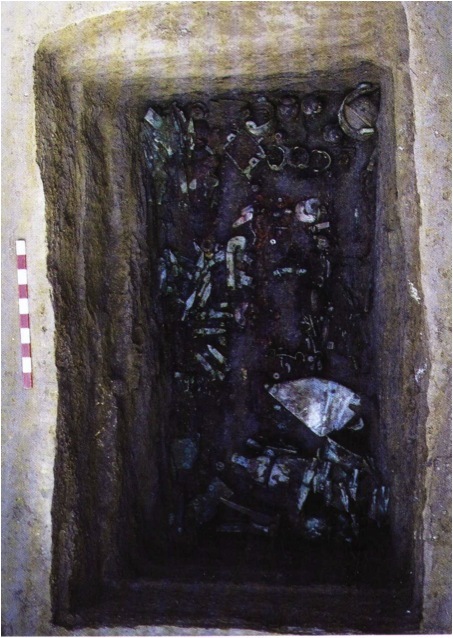 You are currently reading The problem of determining ethnicity: the case of Shang tomb M54 at Anyang at kaogu.